Last week, most expectations regarding the crypto market were met. The correctional uptrend came to an end, although some targets were never reached, and the market is forming another descending trend. New lows are quite possible, while the market still has not hit the bottom. There are some factors showing the market is leaving behind its descending channel and is going to start trading sideways. Still, it is important to continue monitoring the market conditions. The Ether price is moving in a quite unique way on H2. 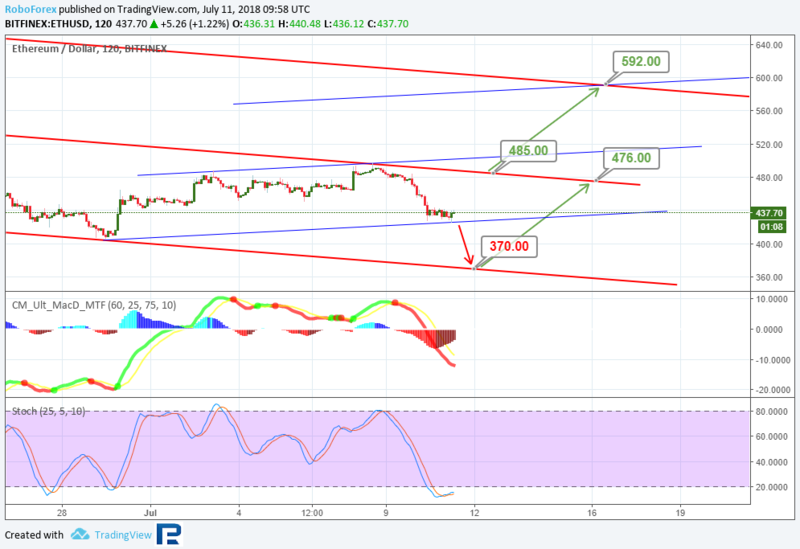 The latest correctional uptrend trend has already tested the major channel resistance, and the bounce is targeting the support at $370, which could then lead the price to the resistance at $476. Meanwhile, the Stochastic is forming a golden cross in the oversold territory, which may signal a pullback to the resistance at $485. In case the price tests the round number of $500, this may cause another rise, now to $592. Bitcoin Cash is still moving down on H2. The price attempted to test the major channel resistance but failed to form an uptrend, pulling back from the resistance and then breaking out the short term uptrend support. This was well confirmed by the black crosses both with Stochastic and the MACD. 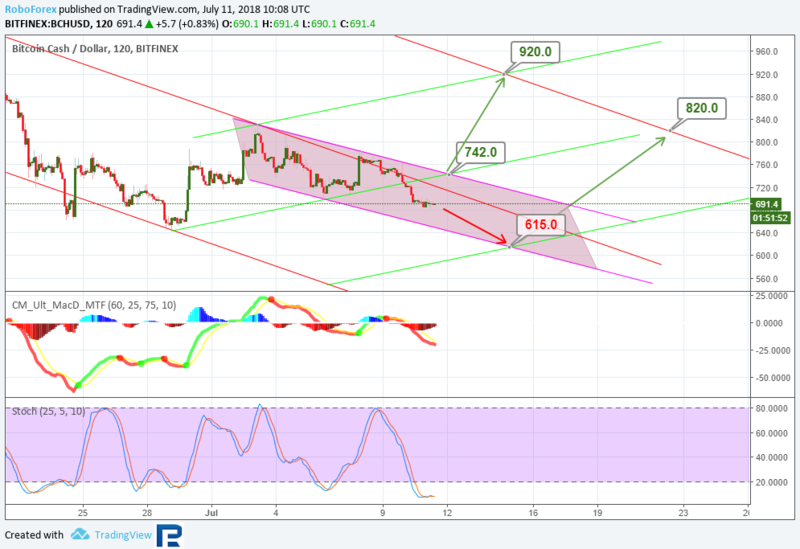 In the short term, there is a descending channel heading towards $615. The only thing that may prevent the price to reach this target is the Stochastic in the oversold territory, which shows market is somewhat uncertain. Such uncertainty may push the price forward to $742, and then even to $920. 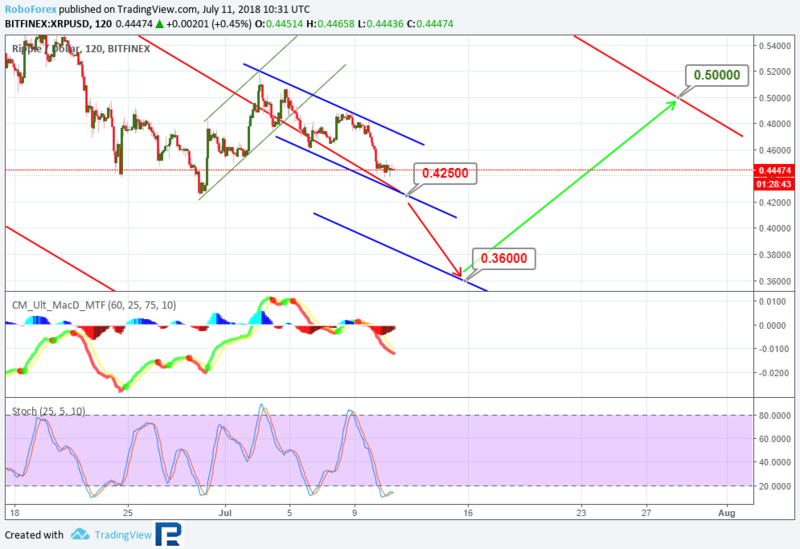 Technically, EOS is trying to make new lows after testing the long term descending channel resistance, which shows it is going quite in line with the overall market sentiment. 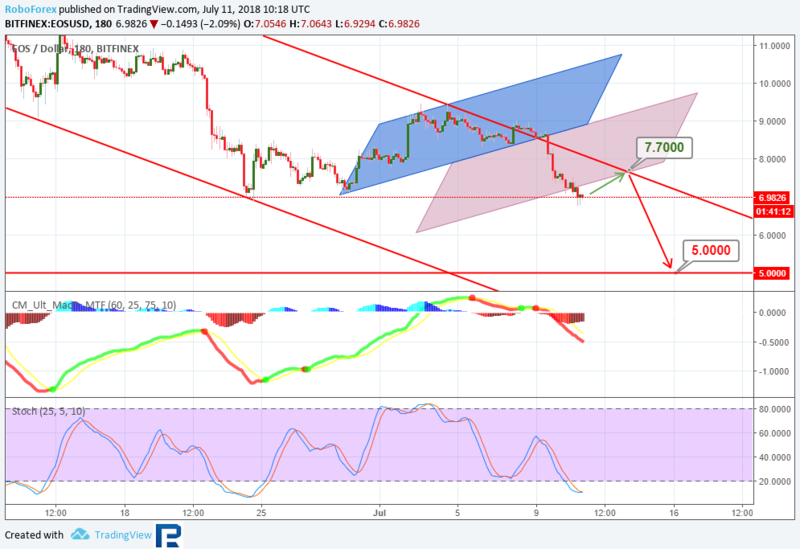 The Stochastic is entering the oversold territory and may form a golden cross, which would mean the price pulling back to $7.70. After breaking out the resistance, the price may head to a new target at $10.00. 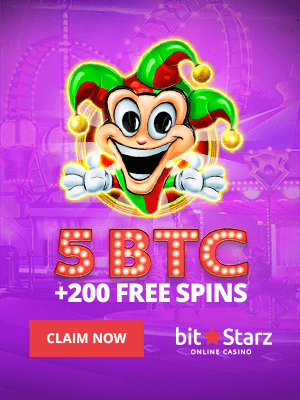 In case a pullback occurs, the price may conversely head down to the round number of $5.00, which is a strategic support. If this happens, however, the MACD may start converging, which will signal for a reversal. 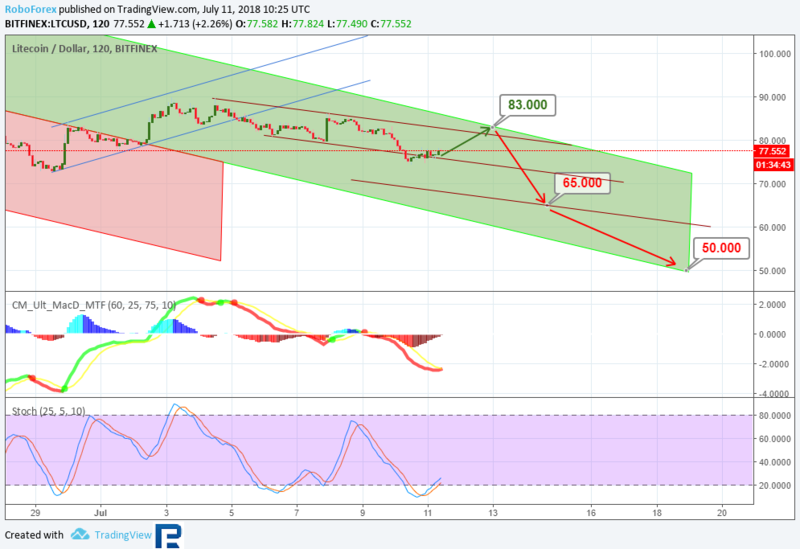 Litecoin is experiencing a correction in an upper projection channel. The short term is descending, and the price is now testing the support, which may lead to both a pullback and a breakout. In case of a pullback, the price may reach both the short term channel resistance and the projection channel resistance at $83, which can be confirmed with the golden crosses formed by the indicators. After the testing is over, the crypto may fall to $65 and then to $50. 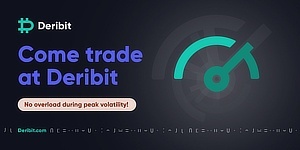 Ripple price is again showing some of the most interesting movement patterns. After breaking out the descending channel resistance, the price may finally reverse the long term trend. The current movement is not only a downtrend, but may also act as the test of the broken out resistance, which has now become support. Locally, the downtrend target is $0.4250, after which the price may make a new low and reach $0.3600. This may be followed with a convergence and a rise to $0.5000.